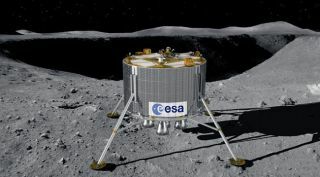 Artist's conception of ESA's robotic lunar lander. Theaerospace company Astrium Space Transportation willcomplete mission design work on a robotic lunar lander under an18-monthcontract with the European Space Agency (ESA) valued at 6.5 millioneuros ($8.5million), Astrium officials announced Sept. 16. Astriumwill use its experience in rendezvous and dockingtechnologies gained as prime contractor for Europe's AutomatedTransfer Vehicle an unmanned cargo freighter thathas made the first ofseveral planned visits to the international space station. ESAgovernments are also likely to be asked to decide in2012 whether the ATV capsules, which are currently destroyed after eachmissionto the station, should be enhanced to permit atmospheric re-entry forcargoreturn. "Itwould not be possible to envisage landing anautomated vehicle on the moon without" the ATV experience, MichaelMenking, Astrium senior vice president for orbital systems and spaceexploration, said in a Sept. 16 statement. Forthe lunar mission, Astrium will design a lander thatwould touch down near the moon's south pole. The rover would then beginexploring the moon'ssurface. The mission is expected to last between six andeight months,Astrium officials said. "Witha strong and successful presence in [low-Earth-orbit], the moon is thenextnatural goalon ourcommon path to further destinations," saidSimonettadi Pippo,ESA director for human spaceflight.